WASHINGTON — Donald Trump suggested during a campaign rally Tuesday that if Hillary Clinton is elected, and appoints judges to try to dismantle the Second Amendment right to bear arms, gun advocates could take action against her. The reference was seen by many in the political world, including the Clinton campaign, as a suggestion that Clinton, and perhaps members of the federal judiciary, should be shot. The incendiary comment, delivered as an off-handed aside, was the latest remark from the Republican presidential nominee to stir intense controversy. 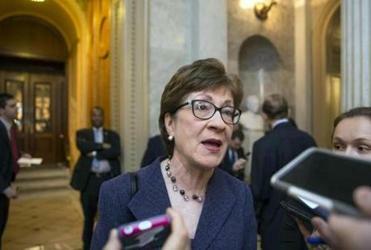 After Senator Susan Collins criticized Donald Trump, the focus was on other regional Republicans and what they would do. “Donald Trump is urging people around this country to act consistent with their convictions in the course of this election,” Indiana Governor Mike Pence, Trump’s running mate, told WCAU, an NBC affiliate in Philadelphia. “Of course’’ Trump was not suggesting violence against Clinton, Pence said. But Trump’s statements drew an immediate rebuke from the Clinton campaign and others across the political spectrum who interpreted his comments as a threat. The former CIA director who served under President George W. Bush from 2006 to 2009, Michael Hayden, blasted Trump on CNN and said such comments from a citizen would typically draw Secret Service attention. “If someone else had said that outside the hall he’d be in the back of a police wagon now with Secret Service questioning him,” Hayden said. He said he used to tell his senior staff at the CIA, “you get to a certain point in this business, you’re not just responsible for what you say, you’re responsible for what people hear. And that might be a good lesson” for Trump. Hayden is one of 50 top Republican national security experts who recently signed onto a letter saying they would not vote for Trump, calling him “unqualified,” too “dangerous,” and lacking the temperament to lead the country. A spokesman for the Secret Service said the agency is not commenting on Trump’s remarks, other than to say it was aware of them. A tweet from the agency Tuesday repeated that statement. Senator Chris Murphy, a Connecticut Democrat, also called Trump out on Twitter. Trump’s comments follow a string of mass shootings and terrorist attacks in the United States and abroad. Trump has responded to those episodes by saying victims could have saved their own lives had they armed themselves with guns. Clinton, in contrast, has advocated for expanding background checks and barring terror suspects from buying firearms. Trump on Tuesday inaccurately accused Clinton of seeking to abolish the Second Amendment because of her support for gun control. Trump’s comment, however, did not appear on its face to be directed at getting voters to the polls. When he said there is “nothing you can do, folks,” he was referring to a scenario in which Clinton is already in office and picking judges. The National Rifle Association began airing its third round of ads in support of Trump on Tuesday. The $3 million ad buy will run nationally on cable television and on broadcast networks in battleground states including Ohio, Pennsylvania, Nevada, and North Carolina. Former Ted Cruz spokeswoman Amanda Carpenter called Trump’s comments “indefensible” and advocated members of the Republican National Committee call an emergency meeting to vacate and replace Trump on the ballot. She said Trump should apologize if he did not mean what he said. Senator Susan Collins, a Maine Republican who said this week she would not vote for Trump, told the Globe that she did not view Trump’s comments as “inciting violence” against Clinton. “But it does, once again, indicate a looseness with language that is inappropriate at best, appalling at worst, for someone who seeks to be in the highest office of our country and a symbol of our nation,” Collins said. Last month, Al Baldasaro, a New Hampshire state representative and a Trump campaign adviser, said that ‘‘Hillary Clinton should be put in the firing line and shot for treason’’ for the way she handled the Benghazi attack. The Secret Service said at the time it was investigating those remarks. Trump spokeswoman Hope Hicks has said that the campaign does not agree with Baldasaro’s statements. Jaclyn Reiss, James Pindell, and Victoria McGrane of the Globe staff contributed to this report. Tracy Jan can be reached at tracy.jan@globe.com. Follow her on Twitter @TracyJan.